The last thing Willa remembers is yawning hugely, blinking hard to focus her gaze and thinking, It’s just after midnight. In 15 minutes, I’ll pull over, wake my husband and let him drive the rest of the way home. Then she must have dozed off, because at 12:05 her van bashed against the highway guardrail and her terrified kids started screaming. No one was badly hurt, thank goodness, but it was a bad end to a family vacation. In fact, a 2018 AAA Foundation for Traffic Safety survey says that one out of every 10 deadly crashes involves a drowsy driver. 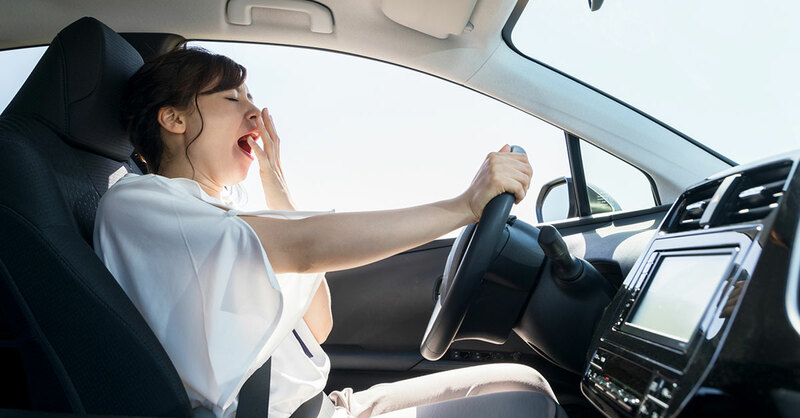 Bad news for women: A 2016, AAA survey showed that nearly almost three in 10 of participants admitted that, just within the previous month, they had driven when they were so sleepy that they could barely keep their eyes open! Among motorists, female drivers are 47% more likely than male drivers to sustain severe injuries, according to a University of Virginia study. Avoid driving at the times when drowsiness is most common. AAA reports a peak in drowsy-driving crashes between midnight and 6:00 am, when most of us are accustomed to sleeping. What you may not know: Reaction time and eye-hand coordination can become as badly impaired after 17 to 19 sleepless hours as when your blood-alcohol level is .05, which is almost the legal limit, Dr. Van Tassel noted. Another surprise: Drowsy-driving accidents also spike in the two hours after lunch. That’s because the body diverts blood toward the digestive tract, which leaves less invigorating oxygen for the brain…and our circadian rhythm naturally dips in the afternoon, triggering the urge to nap. It may not be practical to swear off post-lunch driving altogether, but you can try to limit prolonged afternoon drives. On long trips, stop the car every two hours or every 100 miles, even if you don’t feel drowsy, and walk around for five to 10 minutes. This increases blood flow, sending more oxygen to your brain and enhancing alertness. If you start to feel sleepy and are less than an hour’s drive from your destination, you might consider trying what Dr. Van Tassel calls the “2 + 20” trick. Pull over somewhere safe, take a double dose of caffeine (two cups of regular coffee or two cans of caffeinated diet cola, for example), then nap for 20 minutes. While you snooze, your brain gets a bit of rest…and by the time you wake up, the caffeine will have entered your bloodstream and provided an energy boost. Try this only if you have less than one hour left in your journey, because once the caffeine wears off, your drowsiness will likely be worse than before, Dr. Van Tassel cautioned. And don’t go for a second round, as your body won’t fall for this trick twice without getting some real sleep in between. Travel with a passenger—in AAA’s survey, this reduced the risk for drowsy driving-related crashes by nearly 50%. Conversing with a passenger helps you stay awake…and you can share driving duties. Stagger your caffeine consumption so your companion starts to feel her energy burst and can take the wheel just as your caffeine buzz is waning. Don’t just rely on warning signs for drowsiness. About half of all drivers involved in a drowsy driving crash experience no warning signs before falling asleep. But if you yawn repeatedly, bob your head, can’t keep your eyes focused, drift from your lane or fall into a momentary micro-sleep, do not tempt fate. You’re lucky that you didn’t crash already! Pull over at the first safe spot and get some shut-eye. Yes, this will delay your arrival a bit—but better late than never.